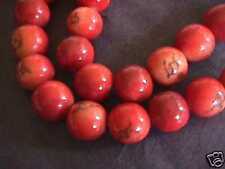 Rough Limestone Red Apple Coral Beads 5mm 16"
These Beads are 5mm in size. The Color is a Beautiful Mottled Shades from Red to Yellow with a Brown Matrix. Check out the rest of my Unusual Goodies. BEAUTIFUL 15 1/2" STRAND CUSHION RECTANGLE 18 MM X 14 MM APPLE CORAL BEADS. These Beads are 20mm in size. The Color is a Beautiful Mottled Shades from Red to Yellow with a Brown Matrix. These swingy pieces are in excellent condition - a beautiful color bead. We are not experts. All sold “as is”. If we see a flaw we will point it out and we attempt to take detailed pictures. Clasp marked Germany. Not a heavy necklace. VTG NATURAL APPLE CORAL LARGE 18 MM ROUND BEADS 19-1/2”LONG 112.7 GMS NECKLACE. Here is a fabulous sponge coral large beads choker necklace. MIX BEADS INCLUDING JASPER, NUT SEED, GENUINE RED SPONGE CORAL HEISHI. APPLE CORAL, BLUE SPONGE CORAL AND SPACE WOOD BEADS AND GOOD QUALITY. NECKLACE 22" -25" LONG. LARGE BEADS GRADUATE FROM 14 MM - 25 MM dia. VINTAGE GRADUATED ROUGH LIMESTONE APPLE SPONGE CORAL BEADS NECKLACE 83.5g 17.75"
There are 38 beads which are graduated with larger beads near the center and smaller beads near the clasp. 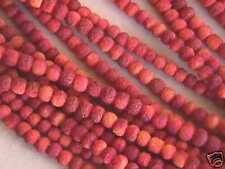 The beads are creamy, pale peach to salmon-pink colored, with black markings; the color is likely added or enhanced. Estate sale apple coral necklace with butterfly pendant. Rough Limestone Apple Coral Beads 15mm 16"
These Beads are 15mm in size. There are about 30 peices.The Color is a Beautiful Mottled Shades from Red to Yellow with a Brown Matrix. Check out the rest of my Unusual Goodies. These Beads range from 16-17mm in size. There are about 27 to 28 peices. The Color is a Beautiful Mottled Shades from Red to Yellow with a Brown Matrix. Check out the rest of my Unusal Goodies. 16-1/2" STRING GENUINE APPLE CORAL BEADS OF MONSTROUS PROPORTION. BEADS ARE @ 1" EACH / OFF MY STONE SIZE CHART / LARGER THAN SS 75. RARE APPLE. 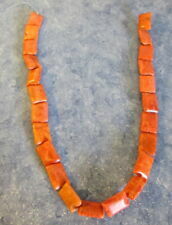 NECKLACE: @ 28" end to end with a 1-3/4" polished coral bead. BLOSSOM CORAL TRIBAL NECKLACE. Since coral collection and mining was banned worldwide in 1992, it is very difficult to find such beads as this, especially of this size. Old vintage 925 Sterling Apple Coral Beaded necklace w/Enamel Sterling charm 17"
Weight: 26.50 grams. Yellowish stones so close to ends Yellow Jade stone. 16" STRING GENUINE APPLE CORAL BEADS OF MONSTROUS PROPORTION. BEADS ARE @ 1" EACH / OFF MY STONE SIZE CHART / LARGER THAN SS 75. RARE APPLE. This pendant is the Shema the central prayer in Judaism.It's written in Hebrew. I'm not sure what the little tan spacer beads are made of and there are a few apple coral tube beads near the clasp as well. These beads are not dyed and have a smooth matte shine, They are in very good condition. IT IS APPROX 22" LONG. COLOR MAY SLIGHTLY DIFFERENT DO TO THE LIGHT.